Carlo Vergara has been known for his funny, romantic and equally heroic alter ego Zaturnnah that conquered the whole nation from print media, stage and full length features. Once, Carlo is the face of a light and endearing face of LGBT community through his creation inspiring Love and Laughter to everyone. And suddenly here comes "Kung Paano ako Naging Leading Lady" that changes the game all together. First released as a straight one act play in CCP's Virgin Lab fest, Vergara's "Leading Lady" tells an unlikely story of two sisters as they struggle to live their lives on a world where superheroes are new celebrities in town. A total departure from Vergara's signature pink comedy comes a dark tale of Heroes, Villains, Family, Love and Power. When Vince De Jesus (Musical's Musical Director and Composer) said "Leading Lady" is dark, I didn't expect it is THAT dark. 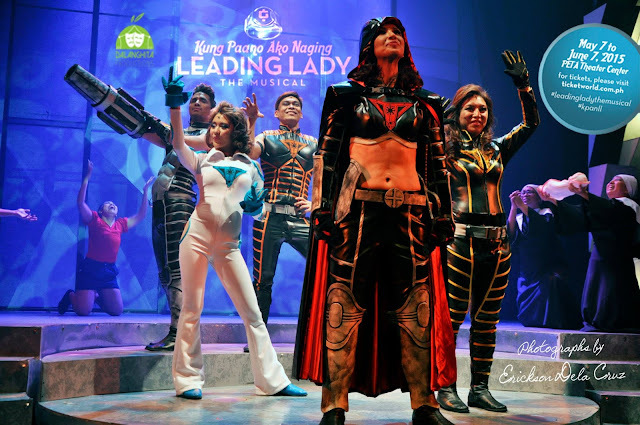 With "Leading Lady", it may first look like an ordinary Superhero inspired play/musical but behind is a picture of rotten reality of the Pinoy Society carefully chronicled by Vergara. "leading Lady" is definitely a breath of fresh air and at the same time it tortures you with images of the society's flaws. But then again the play/musical didn't fail to give the laughs and "kilig" moments that balances everything out. You will also be treated with a superb set of performers. Bituin Escalante as Mely is so lovable and funny. She is like a teddy bear you see in a store and suddenly you want to buy her and bring her home. Bituin is so cute on this role that I really enjoy watching her every single scene. Menchu Lauchengco-Yulo on the other hand steals the spotlight with her heroic performance (and killer abs) as Fuerza Filipinas' leader Madre De Dios which is a complete departure to most of the roles she already played in the past. 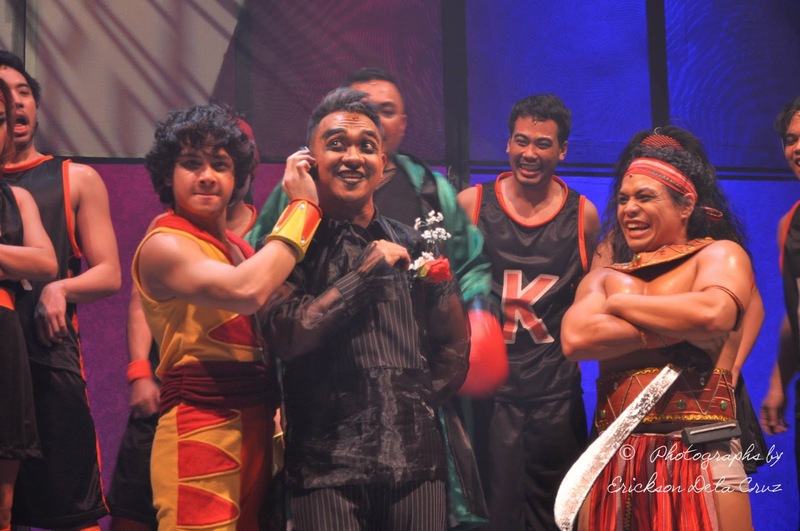 And of course the performance that brought the house down, Nar cabico as Senior Blanco is hands down my favorite. Among others that need recognition are Kakki Teodoro as the Computer AI of Fuerza Filipinas who delivers a lot of good laughs without really trying to be funny, Markki Stroem who plays Leading Man whom shown how far is his improvement on his acting skills and Giannina Ocampo as the vulnerable Nena Babushka. If there is one thing that I don't really like is the straight English parts. Well I know the characters are suppose to be foreigners but still they are Superheroes based in the Philippines. The least I expect is them speaking in Tagalog-English. Personally I believe it kills some momentum and dynamics between characters when they are communicating. Lastly, the musical is nothing without the Music. Though Vince De Jesus openly admits that the songs and music he created are less inspired, the end product still came out as a masterpiece. That only shows De Jesus' skill level. If he can make an epic soundtrack without inspiration, then imagine what he can do with one. If you like a fun musical, "Leading Lady" is definitely for you. Just don't expect this as another Zsa Zsa Zaturnnah. I can see this Musical's big potential. If Zaturnnah can conquer movies why not "leading Lady". I already have ideas for the cast. Its gonna be epic!!! 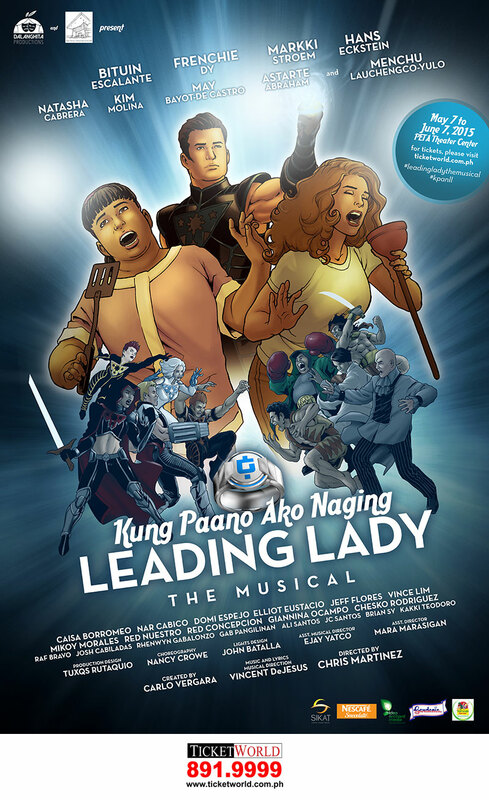 "Kung Paano ako naging Leading Lady" the Musical is closing this weekend (June 4-7). Grab your last chance to experience this awesome musical from Dalanghita Productions. Call Ticketworld at 8919999 for your tickets.